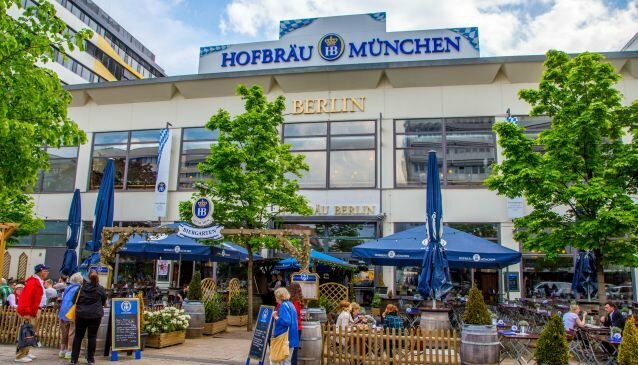 Located in the middle of Berlin right near Alexanderplatz, the Hofbräu Berlin offers a taste of Bavarian culture and cuisine in Germany's capital. Sitting at benches you will be greated by waiters wearing traditional lederhosen and dirndl. Twice daily you will be treated to live music from a traditional Bavarian band which will have you singing 'ein prosit' in no time. They serve a number of beers produced by the famous Hofbräu München including a Helles (light larger), Dunkles (dark beer), Hofbräu Weisse (Wheatbeer) and an alchohol free beer. It goes without saying that they come in a variety of sizes including the traditional 1 litre 'Maß'. Tradition doesn't stop with the menu, with a number of hearty German meals including the ever popular Schweinshaxe, a 1kg pig shank which is served with potato dumplings and Sauerkraut. Just make sure you bring an appetite. It is advisable to make a reservation for weekends or during special seasons like Oktoberfest.